Hardkernel introduced ODROID-H2 single board computer with an Intel Celeron J4105 processor last month. The first Intel board from the company supports up to 32GB RAM via two SO-DIMM sockets, as well as M.2 NVME SSDs and SATA drives, and exposes various other ports such as HDMI 2.0 and DisplayPort video outputs, dual Gigabit Ethernet, and more. We already knew most details about the board, except for the price and exact launch date. Hardkernel launched the board today for $111 on their online store with shipments scheduled the start on November 27th. The board has been tested with Ubuntu 18.04 and 18.10 downloaded directly from Ubuntu website. Hardkernel also published a Wiki for the board, basically explaining how to get started, install Ubuntu on the board, and list all compatible accessories available for the board including DDR4 RAM modules, eMMC flash modules up to 128GB, various plastic enclosures for depending on the hard drives used (or not), a VESA mounting kit, a 15V/4A power supply, and a few other accessories. Thanks to Mihai for the tip. It’s currently $1 cheaper on Amazon. Sure, you miss out on the second Ethernet port, one SATA port and the eMMC socket, but you get Wi-Fi, a housing and a power adapter, oh and a UEFI from a company that has done PC motherboards for well over 30 years. Odroid wants an extra $11.50 for the power adapter. Not saying that this is a bad product as such, just not priced right for what it is. It is a very good option, however, read the spec “Max. 8GB” rly? Also, how much RAM can you afford with the current pricing? I would be happy with 16Gb for now. Could you please share the source of the information about an actual memory limit? I just did above, the Intel ARK shows 8GB. Does it mean that gigabyte supports more memory in fact? I have 16Gb in 1 slot on this PC. Can not post a link for some reason. Asrock J4105 board have max 8Gb in specs, but actually works all up to 32Gb. https://www.intel.com/content/dam/www/public/us/en/documents/datasheets/pentium-celeron-n-series-j-series-datasheet-vol-1.pdf , page 61 (63 in-document). Unfortunately, I couldn’t find any success story to contradict that. Yet? Basically Gemini Lake processors can support up to 32GB. It’s 2.5Ghz with one CPU core active and 2.4GHz with more than one (confirmed personally on real H2 hardware 3 weeks ago). They’ll have a hard time with this pricing though since smart consumers compare prices. Once the H2 will appear in listings like this https://www.heise.de/preisvergleich/?fs=j4105&in= (showing 19% VAT included) people might get that J4105 devices from renowned mainboard manufacturers are way cheaper. > It’s 2.5Ghz with one CPU core active and 2.4GHz with more than one (confirmed personally on real H2 hardware 3 weeks ago). I thought it went to 2.2GHz with the GPU active, no? Yes, that’s what Intel docs tell (but since I only tested headless nothing to ‘confirm’). Fortunately that’s just nitpicking and totally irrelevant since performance difference between 2.2 GHz and 2.5 GHz cpufreq is close to none. Other stuff is more important like memory bandwidth and latency (would be interesting how these are influenced by GPU activity). Thanks for the heads-up on Willy’s page — that’s something I was not aware of. It’s really strange that Odroids are so expensive to ship + VAT. Around 8 years ago, I bought the original ODROID X and Pi models and in the end, the price was so high that I’ve sticked with normal RPis for now. Orange Pis are apparently cheap but are they even legal? No VAT? I have a J4105 based Mini-ITX board from ASRock, and I wouldn’t buy it again. Getting 4k video playback running on both Linux and Windows 10 is a pain in the back, because of Intel’s inability to provide proper drivers. The J4105 can’t do 4k on the HDMI output, only on the DVI. It therefore need a converter chip for HDMI, that also the Intel NUC’s have. The driver/firmware for this chip is a piece of c****, leading to many TVs and monitors not showing anything at all, or only distorted video. Not even the BIOS shows a picture on many 4K TVs. I can only use it on HD TVs, not on 4K. So, if you’re adventurous, buy it, but don’t expect to work it with your TV. You may be better off with a $30 Android box. 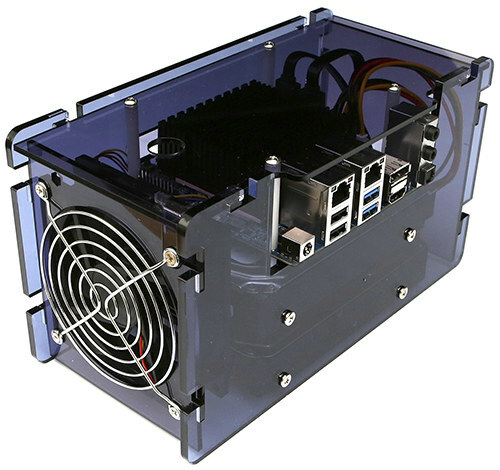 Also, the price isn’t really great, if you can live with the bigger form factor, then the Mini-ITX is the better choice, because it is much cheaper, works with only passive cooling, and has more interfaces. You meant DisplayPort not (old and boring) DVI, right? DVI can’t do 4k, doesn’t matter if it’s single or dual link (the latter is not supported in general these days). Dual-Link can technically do 3,840×2,400 @ 30Hz, but I don’t know of any screens that can accept that kind of input and as such, DVI tends to max out at 2,560×1,600 @ 60Hz. I can think of one, it’s totally off topic but look up the IBM T221. It’s a 22″ LCD monitor with a resolution of 3840×2400 from some time in the early 2000s. 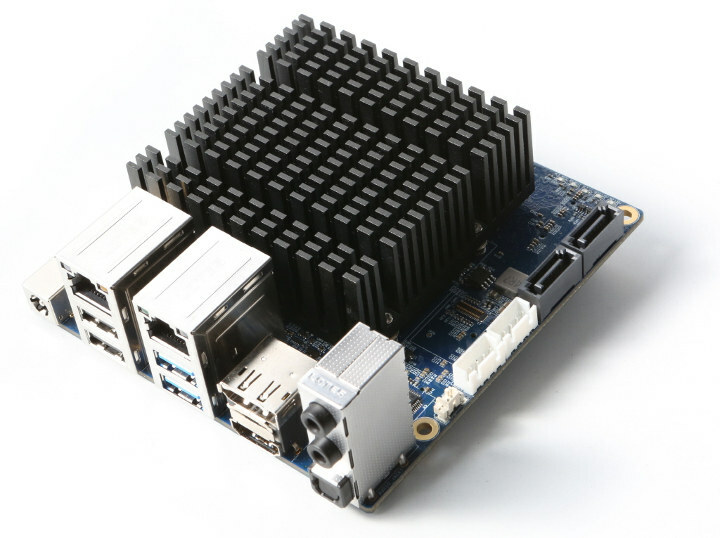 The comparisons to mini-ITX (and other) PC motherboards seems appropriate as the H2 has no GPIO, so it’s not like it fits into the traditional SBC use cases. It’s just a PC smooshed down to a little board. So, if form factor is all it has going for it, it seems fair to compare it to larger boards as long as the size difference is clearly stated. As I don’t need something small that doesn’t have GPIO, I completely don’t see the point of this product. It’s clear that others do have some desire for it, so that’s good. To be fair there’s a ‘Peripheral Expansion Header (20-pin, 2.54mm pitch)’ providing 2 x UART and 2 x I2C to be used with an I2C GPIO expander or various other I2C accessories they already sell (check the wiki link). Not if you want to run Linux. Try installing Linux on that and you’ll see what I mean. Plus, Win10 has a great reputation for bricking those with updates. Soldered RAM, so 8Gb max. Crappy BIOS with no options. No seller on Ali have them in stock for the last 2 weeks. For the same price or even less, you can get Gigabyte BRIX 4105 with true NVMe 2280 256Gb SSD and 8Gb memory upgradable up to 32Gb and USB-C port. Forgot WiFi is also soldered vs proper M2 slot card. No ECC memory support for a reliable NAS/SAN solution? The CPU doesn’t support it, no “consumer” Intel CPU does. If you need ECC on the cheap you’re better off with a C2550 or C2750 motherboard. You get more LAN ports, PCI-Express Slots and IPMI. The C2550 is going to be a little slower but not enough to make a difference with NAS (that you could build out on an H2 to begin with). @node I stand corrected. Thanks. These are also open for preorder along with accessories at https://ameridroid.com/products/odroid-h2. They have very affordable and quick shipping to the US, Canada and Worldwide. I see Hardkernel have update their stress-ng figures to a better stress metric (matrixprod), which has lifted their max temps from high 60s to high 70s C. This is commendable correction. I’m guessing the M.2 size is 2280? Yes, that’s what the specs say. But I have never used one of those, does it mean the older mSATA are not supported? I thought today pretty much all m.2 SSDs are 2280? Also read somewhere else that the m.2 SATA are not supported, but only m.2 NVMe, so you have to check explicitly if your m.2 is SATA or NVMe. I find this all a bit confusing with the m.2 interface. @Joe The M.2 specification allows for up to 4 PCI-E lanes and 1 SATA connection on the same connector but it doesn’t require both. i.e. you can have PCI-E & SATA, just PCI-E or just SATA. In this case HardKernel chose to run the SATA connections to two SATA ports. That didn’t leave any to run to the M.2 connector so it just supports PCI-E. The size (2280 = 22mm wide x 80mm long) doesn’t dictate what’s exposed or not.